Ours is a firm widely engaged in the domain of importing of a wide range of best quality material and in this range we have Non Ferrous Metal Scrap. The offered range has been availed to the industrial patrons for their own usages at the most comprehensive and market leading price range. We have availed this range from the most reliable vending sources. We ALLIED METAL & TUBES are Importers, Exporters, Stockist & Suppliers of Copper, Brass, Aluminum, Bronze, Gunmetal, Zinc, Lead etc. in form of Bar, Wire, PVC Coated Copper Coil, Coils, Round, Sheets, Plates, Channel, Angle, Pipes etc. Ferrous metal contains some degree of iron, non-ferrous metal does not contain iron as a component. Keeping track of contemporary market development, we are devotedly occupied in providing an extensive series of Non Ferrous Metal Scrap. -Buyers who are interested in imported metal scrap on high seas sale basic can only contact. 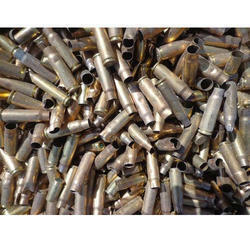 Non Ferrous Metal Scrap(Brass) can be availed from us at competitive prices. The wide range of Non Ferrous Metal Scrap(Brass) is procured from trusted vendors with complete surety of excellent quality and performance. Magpower Linksys is a manufacturing, multi sourcing and indenting company. We represent our principles in Dubai who are in the business of metal scrap for more than a decade and currently exporting around 20000 MTS per month. We, as their indenting agents assure you of quality, quantity and raesonable pricing. - Easy to recycle and process. We are one of the eminent names engaged in trading, manufacturing and importing of an exhaustive range of Non Ferrous Metal Scrap. Manufactured using high quality material, these are widely appreciated among our clients across the nation. Designed in compliance with international quality standards.